Not Reaching Your Goals, What’s Holding You Back? « Does Your Personality Cause Issues At Work? This is my Boston Terrier Bella, and yes she is up in a very large oak tree in our back yard. Terriers love to hunt rats, squirrels and such and we have squirrels in our back yard that hop from one tree to the next and they drive Bella crazy. She would run around on the ground looking up in the trees for them barking to no end. She would put her paws at the base of the tree and jump up and down thinking she could get them. Then one day as she was chasing the squirrels from tree to tree she just didn’t stop at the bottom of the tree like usual, she ran and started climbing up the oak after the squirrel, reaching a height of around 12 feet. 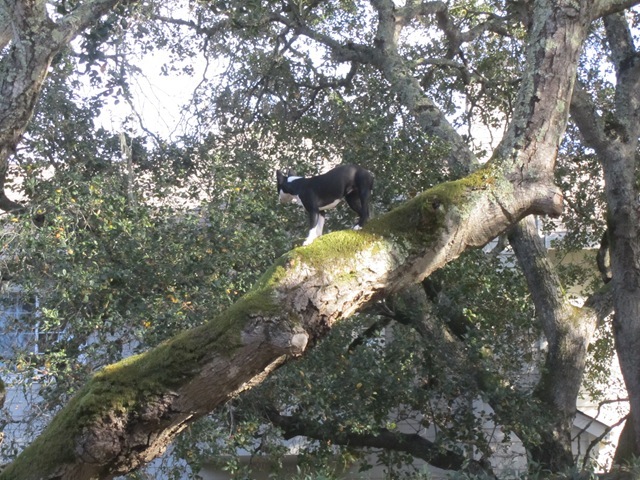 I have shown pictures and videos of her to many people and her veterinarian who are amazed that a dog can climb trees. Climbing trees has become a regular event for Bella. If we cannot find her we start looking up out in the yard and sure enough most of the time she is perched in a tree waiting to see a squirrel. Bella decided that in order for her to get a squirrel she had to push past what her limitations had been known to be for a dog and pursue unknown territories that would bring her closer to reaching her goal. Far too many times we are held back from pursuing something because of common perceptions such as; I don’t have the education, I don’t look the part, I can’t speak well, I’m too old, I’m too young or I can’t climb the tree because I am a dog. I think you get the idea. We can be our worst enemy when it comes to pursuing our dreams and goals. In 2005 ThinkTQ (ThinkTQ.com) published a study about how infrequently people developed strategies for achieving their dreams and goals. Here is what the study revealed about the people tested. 26% focus on specific, tangible targets for what they want in life. 19% set goals aligned with their purpose, mission and passion. 15% write down all their goals in specific measurable detail. 12% maintain a clear defined goal for every major interest and life role. 7% take daily action toward the attainment of at least one goal. What dream or goal is it that you would really like to achieve? What is it that is holding you back? If you need some great guidance and inspiration you might want to pick up a copy of the John Maxwell’s book. I highly recommend it. Hummm…I wonder if Bella got a hold of my copy? This entry was posted on Wednesday, January 28th, 2015 at 8:00 am by Tina Del Buono, PMAC.